Lazy Dog to bake for Charitable GIVE Treats - The Lazy Dog Cookie Co. Inc.
"All-natural GIVE Treats come in three delicious vegan flavors: Peanut Butter, Pizza Crust and Sweet Potato. Heart-shaped GIVE Treats contain no wheat, corn or soy. Known for their ingredient integrity and quality control, Lazy Dog Cookie Co., was chosen as the contract supplier for GIVE Treats. Natural fiber boxes, POP displays and promotional materials make GIVE Treats stand out in the retail environment." Having served the independent pet store market for 15 years, WholesalePet.com is launching its first-ever product line. 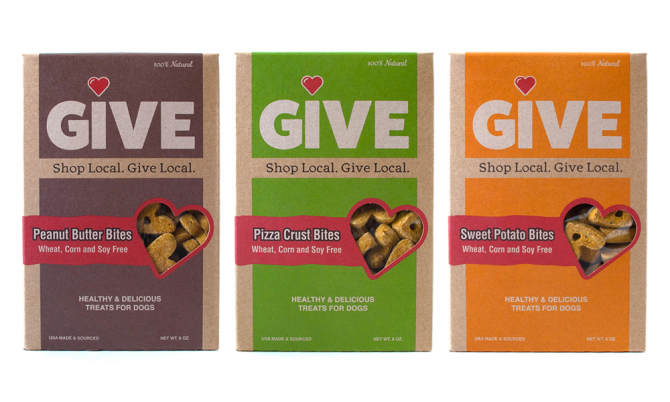 According to the company, GIVE Treats are products with a purpose, empowering neighborhood pet stores to profit while helping local non-profit animal organizations. Each box of GIVE Treats is custom labeled with a store’s logo and the logo of their designated charity. For every box of GIVE Treats sold, retailers donate $1 to their favorite local charity. All-natural GIVE Treats come in three delicious vegan flavors: Peanut Butter, Pizza Crust and Sweet Potato. Heart-shaped GIVE Treats contain no wheat, corn or soy. Known for their ingredient integrity and quality control, Lazy Dog Cookie Co., was chosen as the contract supplier for GIVE Treats. Natural fiber boxes, POP displays and promotional materials make GIVE Treats stand out in the retail environment. GIVE Treats hit the market in mid-September, and are exclusively sold by WholesalePet.com. For more information, visit www.givelocalpet.com, email [email protected] or call 800-472-8984.